Position Available – Part-Time Cook! The International Fellowship House is currently seeking a part-time (20-25 hours/week) Cook and Kitchen Manager. Combine your passion for serving others with your passion for food! Do you enjoy making delicious food? Do you love caring for and serving people? Are you interested in learning about other cultures? Do you have an interest in playing a key role in a diverse community? If you answered yes to these questions, read on! The International Fellowship House (IFH) is a Christian nonprofit that desires to see international students from all cultures and religions thriving academically, socially, and spiritually. A primary way we do this is by providing a home to around twenty-two male international students and researchers. More than just a boarding house, the IFH strives to have as much of the atmosphere, comfort, and fellowship of a home as possible. We believe that sharing meals is essential for creating a home and for true community to develop. Therefore, the position of Cook and Kitchen Manager is of vital importance to the IFH. The primary responsibility of the Cook and Kitchen Manager is to help facilitate this environment through the service of meals and kitchen management. In addition to preparing meals and managing the kitchen, the Cook and Kitchen Manager is encouraged and invited to be an active participant in the community through participating in activities, sharing occasional meals and cultivating meaningful relationships. Compensation/Benefits: salaried position of $1700 per month, paid holidays and vacation days, transportation allowance, free dinner on nights cooked. A Faith That Does Justice is offering a New Testament Workshop. Learn more about what the New Testament teaches about the life of faith. “Come and see” (John 1:46). Rev. Thomas D. Stegman, SJ, Dean of the Boston College School of Theology and Ministry, and Professor Ordinarius of New Testament in its ecclesiastical faculty will lead the workshop. Fr. Stegman is the recipient of many academic awards, including the American Bible Society’s Scholarly Achievement Award and the Aquinas Institute Fellowship at Emory University. He held the Rev. Francis C. Wade Chair at Marquette University in 2010, and the Anna and Donald Waite Endowed Chair in Jesuit Education at Creighton University in the academic year 2015. He has published widely. Please join us for an enlightening evening of learning and discussion. MYSTIC CHORALE SINGS WITH YSAYE BARNWELL!! The chorus will also be joined by South African friends Nthabi Thakadu, Phakamani Pega, and Pumla Bhungane, as well as pianist extraordinaire Jonathan Singleton. All of the songs—past and present, South African and American—deliver powerful and relevant messages for today’s world! Enjoy this video of Mystic singing Usiletheal Uxolo (Nelson Mandela, You Bring Us Peace) at a past concert. For the past five months, the UniteBoston Reps have been engaging in various activities to listen and learn from their communities. These past four weeks, each rep will be writing a brief blog to share their findings with the Greater Boston Christian community. This week, Andrew Walker, UB Rep in the Back Bay, shares his insights. When I think of Back Bay, two symbols come to mind that help me capture the character of this neighborhood: a pen and a wagon wheel. The pen represents learning and the pursuits that require a high level of literacy. Most of the activities that are evident in the Back Bay, from commerce to the various trades and occupations require learning and literacy as basic preconditions. The wagon wheel brings to mind travel; and the Back Bay is certainly a hub of travel with Back Bay Station serving as a major gateway bringing people into the city and sending them to destinations within the region and beyond. Numerous hotels and restaurants provide hospitality for these travelers as well as those calling this home. And a healthy selection of shops along Boylston and Newbury Street attract shoppers from near and far. For the most part, the resident population in Back Bay are those who can afford the high real estate prices, which consists of people with professional or highly technical training who hold jobs in the near vicinity. Among them are many families, as well as many with no close family ties. 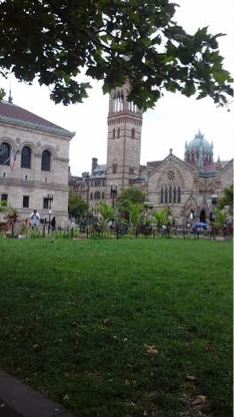 The churches in the Back Bay are mostly examples of “traditional mainstream” denominations. Their congregations draw from the immediate neighborhoods, but also among them are some who come from surrounding schools as well some who commute to church, just as they commute to work sites in the Back Bay. But there are also a few more recent church planting efforts. The CityLife Presbyterian Church and Renewal Church are two examples of growing fellowships whose leaders speak with great excitement about praying and working for renewal in the city guided by the Spirit of Christ. They seem to be reaching mostly students and young working folks. So one might gain an impression of the Back Bay being a crossroads offering comfortable domesticity as well as lively commercial and entertainment activity. But there is also in the Back Bay a confrontation with a less comfortable contrast: In 2013 the celebration of cosmopolitan expansiveness that is so much a part of the Boston Marathon and so appropriate to the character of the Back Bay was shattered by the explosion of two bombs. We witnessed and marveled at heroic interventions by so many first responders. In the following weeks admirable efforts were launched in aid of the casualties and their families. All of Boston’s citizens rightly drew encouragement from these acts and efforts. And then, four months later a young man was shot to death on Boylston Str., just across from Trinity Church. This event was not completely over looked by local media, but it got nowhere near the attention of the Marathon Bombing. That young man’s mother has asked us to consider, was the loss of her son any less tragic? Similarly, leaders in other Boston neighborhoods have asked us to consider, of the more than 300 shootings in other parts of the city, over the past ten years, are they any less tragic that they are deserving of so much less attention? As I consider the question that we are all addressing, what’s God doing among us, this contrast weighs heavily on my heart. But I am not without encouragement. At First Lutheran Church in Boston, my home congregation on Berkeley Street, I was invited this spring to present 3 sessions of instruction in Biblical Peacemaking during Sunday Morning Adult Bible study. I was pleasantly surprised at how well received it was. Three sessions grew into five sessions and there were more participants at the last session than at the first. I was especially delighted to observe that the sessions included allot of discussion and many thoughtful and penetrative questions were raised and debated. Perhaps most encouraging was the readiness of participants to consider the consequences of avoidance of difficult questions; how the patterns of avoidance hinder discussion when important issues like budget need to be addressed. Participants in the congregation at First Lutheran are in many ways similar to the folks in the immediate neighborhood. Some are families, some are single, many are students. And we are blessed by much cultural diversity. Career interests are similar. Economic goals are similar. So I don’t consider it too much of a stretch of imagination to suppose that the thoughtful interest in Biblical Peacemaking I was surprised by at First Lutheran might imply that a similar interest exists in the larger community. God is working among us and we’ll see the benefits when we listen to Him and to one another.